In the early 1970s, not long after the May 4th shootings, my parents met at a house party at Kent State University, where they were both students. When I was born in 1984, they still lived within the Kent city limits, in a tiny house across the street from Stoddard's Ice Cream. I may have been born down the road at a hospital in Akron, but in every other way, I got my start in Kent. In the early '90s, I began attending day camp at Kent State for Kids, held on the KSU campus. My dad dropped me off at camp on his a way to work each morning, & I spent my days in "classes" that I'd chosen out of a booklet designed to look like a course catalog. I took archery & swimming & miming (?!) & Korean in the same buildings where my parents had attended their college classes - & where I would later attend my own. I wrote poetry while lying on the May 4th memorial with my creative writing class, which produced my first piece of "published" writing. Later on in the '90s, my mom returned to Kent State to pursue her masters in library science. I remember waiting in line with her at the registrar's office & begging her to let me spray paint the giant rock at the front of campus, a college tradition that seemed like the ultimate in adulthood to my childlike understanding. "Maybe when you're older," she told me. In 1997, when we hosted my bat mitzvah party in the Rathskellar, a bar at the student center, I again begged my mom to let my friends & me paint the rock as part of the celebration. I was unsuccessful in my plea; I have still never painted the rock. In 2001, when I was applying to colleges, I lied & told my mother that I had sent in my application to Kent State. I had not. (Sorry, Mom.) 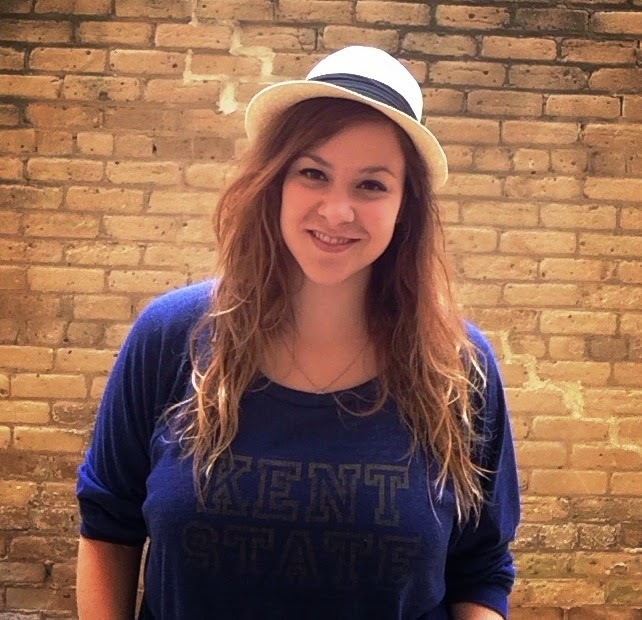 I loved Kent State, but it felt like my childhood, not my future. I had no interest in attending a college I'd known so intimately for my entire life. And in 2005, when I decided I couldn't stay at Ohio University for another second, I moved back into my mother's house & began attending Kent State University, just seven miles down the road. I felt like a massive failure; it seemed seemed like the ultimate embarrassment to have transferred to the hometown school, the school my parents went to, the school half of the population of my high school went to. It didn't take me long to realize it was one of the best decisions of my life. I graduated from Kent State in 2007 with a Bachelor's of Science in News. Most of it was earned in Taylor Hall, the journalism building - the building whose parking lot paves the area where the unthinkable happened on May 4th, 1970. Each year on the anniversary of the shootings, I joined Kent State Hillel in placing rocks on each of the blocked-off spots where four students died. These days, Taylor Hall is the May 4th Visitors Center, dedicated to preserving the memory of what happened that day & why - what it meant for the school & the country & for history. On my last day of classes at Kent State, I called my mother in tears: "I'm going to come back," I promised. "Maybe I'll get my masters here, too." I never wanted to go to Kent State - but I have always been Kent State, intentionally or otherwise. Today & every day, I am proud to call myself a part of a university that carries so much history & still has so much pride - & oh, yeah, this degree is pretty nice, too. I am a Kent State alum from a family of Kent State alums. And #WeAreKentState. This post was written for #WeAreKentState, a Facebook event asking Kent State supporters to wear blue & gold today. It was organized as a show of pride in response to Urban Outfitters' recent decision to sell a "vintage" KSU sweatshirt that appears to be splattered with blood.